The third prize of $150,000 was claimed by another Indian American Arjun Ramani. Indian American teenager Indrani Das has won the top award of $250,000 in the prestigious Regeneron Science Talent Search completion. The accolade is for her study of a possible approach on treating the death of neurons due to brain injuries or neurodegenerative diseases. The 17-year-old girl from New Jersey won the oldest science competition for students, which is also known as the ‘Junior Nobel Prize’. Das was honored along with other 39 finalists on Wednesday at the annual Regeneron Science Talent Search Awards Gala. A contributor to neuron death is astrogliosis, a condition that occurs when cells called astrocytes react to injury by growing, dividing and reducing their uptake of glutamate, which in excess is toxic to neurons. In a laboratory model, Das showed that exosomes isolated from astrocytes transfected with micro RNA-124a both improved astrocyte uptake of glutamate and increased neuron survival. The second place honors and $175,000 went to 18-year-old Aaron Yeiser. The third prize of $150,000 was claimed by another Indian American, 18-year-old Arjun Ramani, from Indiana. “Now more than ever, we need our nation’s best and brightest young minds to pursue their interest in science and use their talents to solve our world’s most intractable problems,” said Maya Ajmera, President and CEO of Society for Science & the Public and Publisher of Science News. Apart from Das and Ramani three other Indian American teenagers also made to the top-ten list and won honors for their studies in different fields. 17-year old Archana Verma from New York received a $90,000 award for her study of the molecular orbital energy dynamics of dyes, which may someday result in windows that produce solar energy. 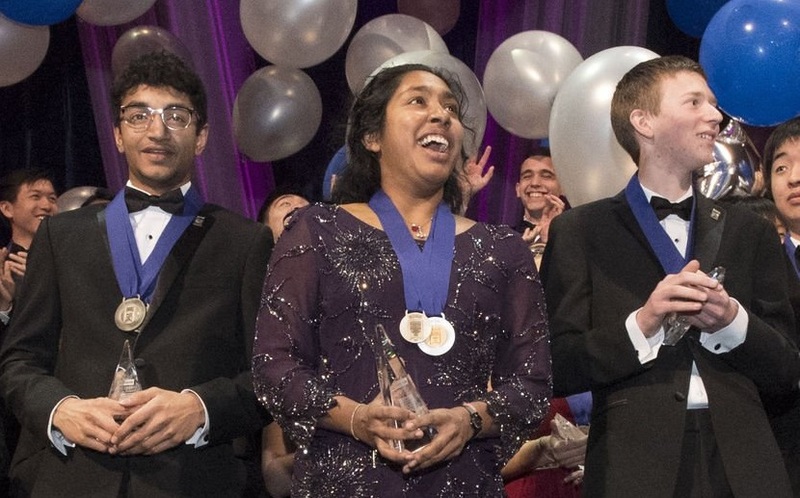 Prathik Naidu, 18, from Virgina won a $70,000 prize for his creation of a new machine learning software to study 3-D interactions of the human genome in cancer. Vrinda Madan, 17, from Florida’s Orlando received a $50,000 award for her study of 24 potential compounds for the treatment of malaria, in which she found the two potential candidates that appear to target the disease-causing organism in a novel way and may warrant further study. Society for Science & the Public has organized and produced the Science Talent Search since its inception in 1942. It is now sponsored by the medical company Regeneron. Each year, approximately 1,700 student entrants to the Science Talent Search submit original research in critically important scientific fields of study. These are judged by leading experts in their fields. Altogether, this year’s forty finalists took home more than $1.8 million in awards.